The Resurfx non-ablative fractional laser emits precise columns of heat energy into the skin to stimulate new collagen growth and retexture the skin. The controlled heat laser delivery has been used for decades in dermatology to trigger the body to "repair" the skin, leading to collagen production. Stimulating new collagen production is the key to more radiant, youthful looking skin. Non-ablative means the skin is not broken, so the resurfaced skin will not bleed or get infected during treatment or after, as it can with other technologies. Thus there is minimal downtime and risk. No required time to rest or heal means no social downtime. There may be some redness and swelling right after the procedure and the following few days. You must wear sunscreen and stay out of the sun for a few days. You can reapply makeup the next day. A series of 3-5 sessions gives optimal results, done in 4-6 week intervals. Gradual improvement in tone may be seen as soon as a couple weeks after the procedure, and benefits of collagen production start appearing after three months. With the new Lumenis M-22 platform, we can offer our "Photofabulous" treatments as well! 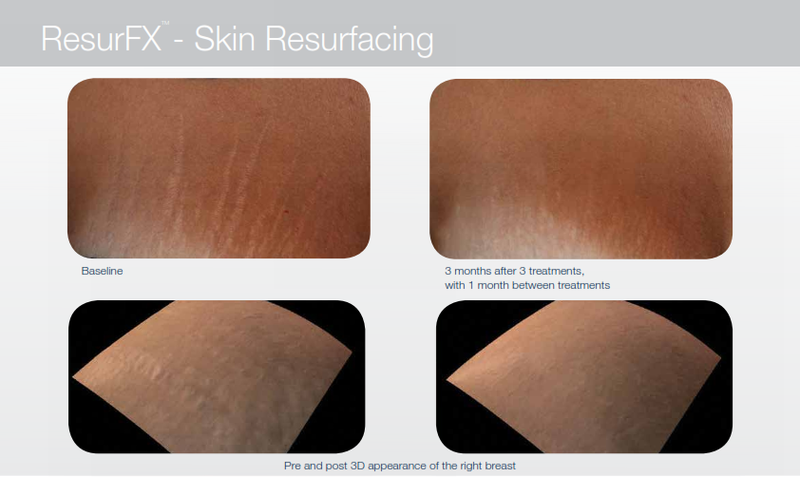 This combines the benefits of IPL and Resurfx laser. The combination of these two modalities will address both tone and texture. By decreasing pigmentation and redness while simultaneously triggering collagen production, your skin will become more even in color and texture. For your utmost comfort, we are going to have you arrive 30 minutes before your scheduled appointment so that we can wash your face and apply a topical numbing cream. You may experience a warm or prickling sensation as the laser is applied to the skin, but the treatment should not be painful. IPL and Resurfx laser are not for everyone. We can not treat over an active infection, inflammatory skin conditions, or skin cancer. Tanning beds must be avoided two weeks prior to treatment as well as extended sun exposure. We will not be able to treat you if you have fake tanner on unless you can completely exfoliate it off prior to your session. Some antibiotics must be avoided too. Patients with lupus and some other autoimmune diseases are not usually good candidates either.